I am not adventurous when it comes in trying new dishes especially if its something unusual for me. I've been here in Qatar for almost 8 years but not even give a try to some of Arabs cuisine, I guess I'm not really into so much spices. One on my bucket list is to overcome the fear by trying some or at least one exotic food. 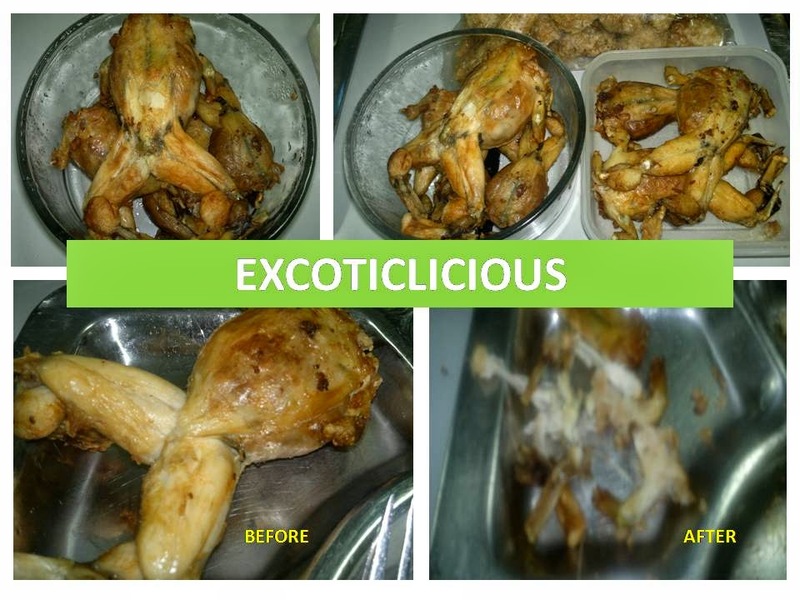 Yup right exotic food...unusual food. I already watched several shows featuring restaurants that serves snakes, rats, cricket or grasshopper, frogs and etc. Parang pinapanood ko pa lang nagtatayuan na ang mga balahibo ko at bumabaligtad na ang sikmura ko, but since according to those people those foods are clean and not poisonous. Its not the rat or frog that we commonly seen in the house or mud. One of my friend and officemate Louie just got back from vacation in Philippines. He's from Pampanga, they say sa Pampanga maraming mga restaurants that serves exotic food and guys exotic food since kakaiba nga is mabibili in a higher price compare to an ordinary dish. At first I am hesitated to eat, yung tinitingnan ko pa lang kinikilabutan na ako at parang babaligtad na ang sikmura ko pero I control my mind. If I will not try how can I know that I can and how can I prove that "palaka" or frog is mas malasa sa chicken. Honestly, I myself can't believe na nagawa ko! without vomiting ha. Some of my officemates, friends and relatives doesn't want to try, especially when they saw this photo...hahahaha, I'm not an exotic foodie as well but as I've said just for the sake of trying and overcoming my "eiw" and "yikes" to some unusual food, I did. One down on my bucket list, what will be the next challenge to overcome? hahaha. Try nyo in fairness naman to the "kokak" meet malasa naman nga talaga. The one that I tried is relyenong kokak with pork meat inside. Hope you guys can try also not just for happy tummy but in overcoming some fear or doubt in yourself that you can.